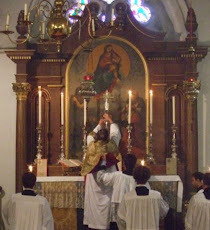 Fr Hunwicke's Mutual Enrichment: Are they excluding orthodox priests from the episcopate? Now if only Popes John Paul II and Benedict XVI had made it a condition of being appointed to both the episcopate and the cardinalate that a candidate fully agreed with the entire contents of Familiaris Consortio we probably wouldn't be in the situation we have today. Interesting and revealing post. Thank you Father. The Sussex Pad problem has been solved by your former employers buying the establishment up for school accommodation. As in latter days so often in Oxford, Gown 1, Town 0. I have no doubt this is true, Father but bear in mind that most of the current crop of stinkers who have introduced the heterodoxy litmus test, were themselves appointed by either John Paul II or Benedict. Whatever JPII's merits as a pastor and anti-communist warrior, he appointed some absolutely dreadful bishops, including the former Cardinal Archbishop of Buenos Aires, now the occupant of the Chair of St. Peter. And if recent publications are to believed, it was done over the objections of former Jesuit Superior General Kolvenbach. There are forces at work here which we do not fully comprehend and this is part of a longstanding and ongoing chastisement of the Church. Surely, you jest, dear father. In the colonies across the pond, for years, many potentially excellent candidates for the priesthood have been rejected or driven from seminaries, as I have heard. Could then one, honestly, not expect the same throughout the priesthood? the Catholic Church, whose choice among the elite has yielded the Papacy to its present occupant? Does 1 + 1 = 2? Swearing the Oath Against Modernism was obligatory for all doctoral candidates of Roman Catholic Universities, all seminary professors and all bishops and religious superiors until 1967. If taking an oath were effective in eliminating the heterodox from positions of authority in the Church, we would not be in the present lamentable situation of the corruption of the Teaching of the Faith. I was once lamenting the dearth of bold and courageous, actually-Christian, doctrinal purity emanating from our leadership when a priest friend of mine said "Well, when the powers-that-be were recruiting queers and heretics for 20 years do you really expect those that have risen to the top to be stalwart defenders of the faith?" We have had Popes who are cited in the historical materials as pawns of temporal powers in the past, and bad men who were elected Pope, both scenarios of which remind us that colleges of electors are from time to time cages aux folles and somehow the Church marches on. Today I try to dwell on the fact that Alexander VI was followed up by Pius V about a half century later. So it's possible. And I'm banking on it tho I'd prefer for the world not to have to wait for half a century to see it happen again. The entire Church has been a "pawn of a temporal power" since the Americans began occupying Europe in 1943. Traddies remain in denial about this and blame popes, modernists and communist infiltration for our malaise. It was St. Paul Miki who first opened my eyes to the reality of our situation.